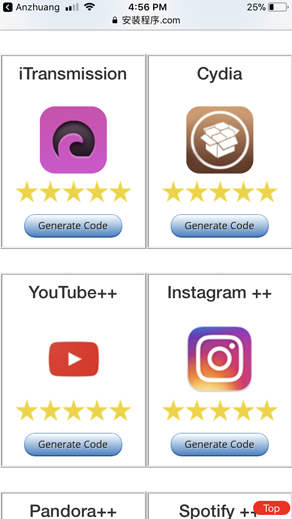 Cydia is a third-party app store for jailbroken iPhones, iPads, and iPod Touches. Cydia is developed by Jay Freeman also known as saurik. But anyone cannot download it directly from Saurik’s official site. You must jailbreak your iOS device to install Cydia. Either you can download Cydia with alternative jailbreak methods. There are several ways to jailbreak iOS devices for Cydia. We have listed all the Cydia installation methods below. Ziyu is a jailbreak repo extraction method to install Cydia to iPhones & iPads. It extracts special jailbreak repos / sources to install jailbreak apps. You can install Ziyu from zJailbreak app store. Ziyu released initially targeting iOS 12.1 version. Now it is compatible to install jailbreak apps for iOS 12.1.2 and iOS 12.1.3 versions too. Step 01 - Install Ziyu from zJailbreak app store. Download zJailbreak from Home page. Step 02 - Open Ziyu repo extractor and click on the Browse Repo List. 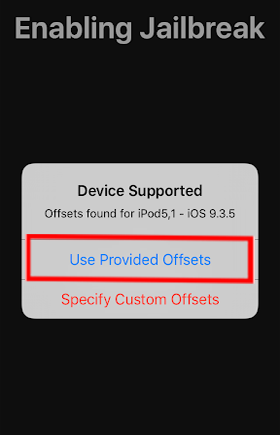 Step 03 - Select http://ios.cydia.in repo and copy it. Step 04 - Go back to Ziyu app. Click Extract repo button. Paste the copied Cydia repo into it. Step 05 - Click on the extract button. Then it will begin to extract the Cydia repo to install it. 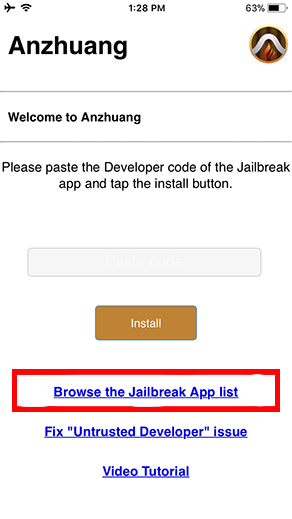 Anzhuang is online jailbreak solution to install Cydia. Also, it installs popular jailbreak apps. It based on the developer code extraction method. At this time Anzhuang available on zJailbreak third-party app store. It is compatible up to iOS 12.1.2 version including iOS 12.1.3 beta as app installer. Also you can Jailbreak iOS 12 / iOS 12.0.1 to install Cydia with Anzhuang. Initially, you should have to install zJailbreak to your device. You can download it from our homepage. Step 01 - Install Anzhuang. Step 02 - Open Anzhuang app now. Step 03 - Tap "Browse jailbreak app" list link. Step 04 - Go to App manager category. Step 05 - Copy the developer code. Step 06 - Paste developer code on Anzhuang. Step 07 - Tap install. Step 08 - Now you will have Cydia on your homescreen. 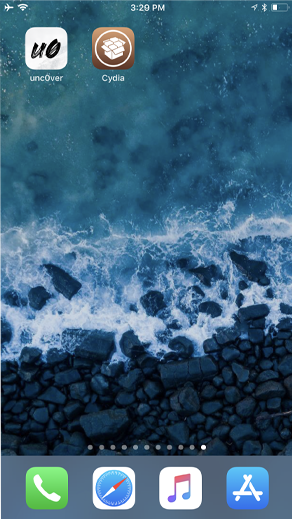 Unc0ver is newly released Jailbreak for iOS 11.3.1 to iOS 11 versions. Also, it is supported to jailbreak iOS 11.4 beta 1 to beta 3 versions too. It is developed by @pwn20wnd & @sbingner. 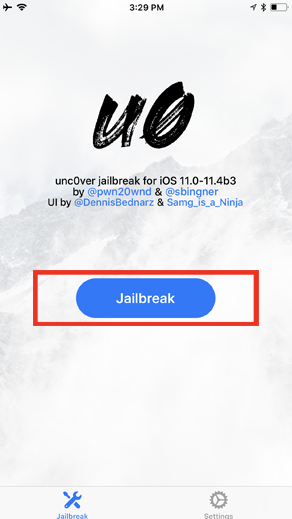 Unc0ver Jailbreak Online tool is exclusive with zJailbreak Silzee Online JB app. Step 01 - Open zJailbreak from your iOS device to install the Silzee app. Step 02 - Launch Silzee and Find for Unc0ver Jailbreak to install. Step 03 - Once the app has installed to your device, Go to Settings > General > Profile and device management and trust the unc0ver app. Step 04 - Run the Unc0ver app and tap on the jailbreak button start the Jailbreak process. Step 05 - Once Finished, It will have installed Cydia on your device homescreen. 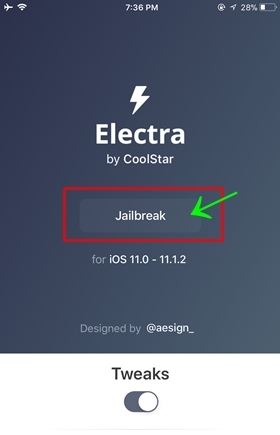 Electra semi-untethered Jailbreak supports iOS 11 to iOS 11.4 versions jailbreak. It has Electra1131 for iOS 11.2 to iOS 11.3.1 including iOS 11.4 beta 1 to beta 3 and Electra1112 for iOS 11 to iOS 11.1.2 versions. It is available two ways to complete the Electra jailbreak as Online or PC support method. 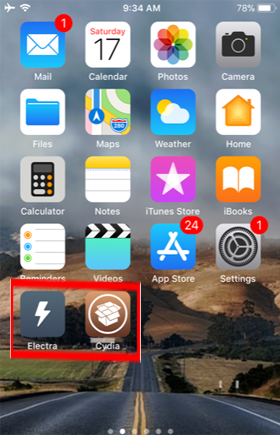 Electra online jailbreak method is available under Silzee Online JB app exclusively on zJailbreak and recommends it as the easiest way to download Cydia. First of all, you must have to install zJailbreak app store to install Electra Jailbreak online. 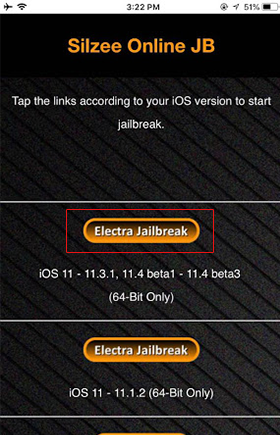 Then you can follow the given below zJailbreak Electra online guide to install Cydia easily. Step 01 - Open zJailbreak app store to install Silzee app. Step 02 - Find Electra app from Silzee according to your iOS version and install. Step 03 - Go to Settings > General > Profile and device management and trust the Electra app. Step 04 - Run Electra App and tap jailbreak button. Step 05 - Once Jailbreak process complete, it has installed Cydia on your device. LiberiOS supports iOS 11.1.2 to iOS 11 versions. But no stable Cydia for LiberiOS. So we recommended staying in older version until Saurik fixes the issues. Download LiberiOS & Cydia Impactor from following buttons. 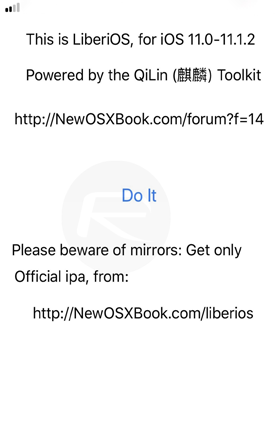 Step 01 - Download LiberiOS & Cydia Impactor using above buttons. Step 02 - Connect your device to PC. Open Cydia Impactor. Step 05 - Wait for the complete message. Step 07 - Now open the app and tap Do it button. 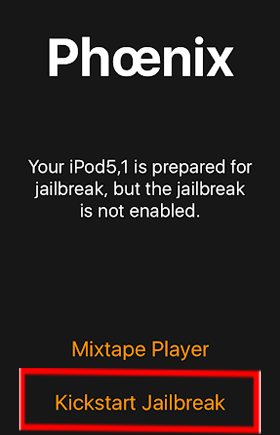 Meridian jailbreak released for iOS 10 - iOS 10.3.3 running all 64-bit devices by PsychoTea/@iBSparkes. Silzee offers Online Jailbreak solution for Meridian Jailbreak. Step 01 - If you have not downloaded zJailbreak yet, Download it. Step 02 - Find for Silzee Online JB app. Click to install. Step 03 - Then Install Meridian Jailbreak app directly to your device. Step 04 - Once installed, verify the Jailbreak app. Go to the Settings app, go to General > Profiles & Device Management. 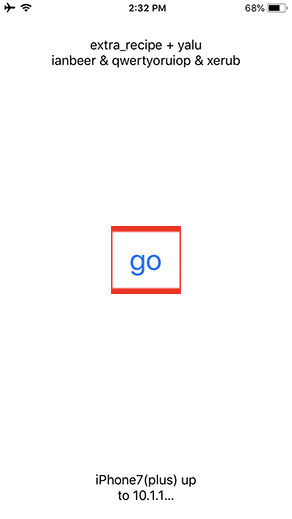 Step 05 - Now run Meridian app and Tap on the “Go” button. Step 06 - Finally, you can find Cydia on your device homescreen. G0blin supports iOS 10.3.3 to iOS 10 but only for 64-bit devices exclude iPhone 7. iOS 10.3.3 to iOS 10 32-bit users can use H3lix jailbreak tool. G0blin jailbreak tool has online and with PC method. Online method is the easiest method among these two methods. 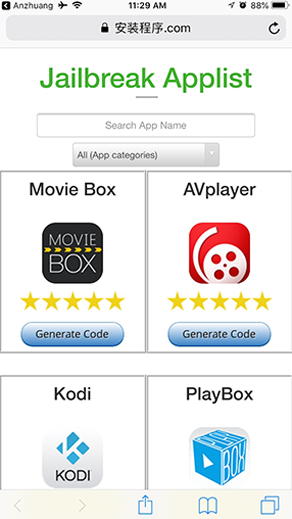 G0blin online tool can be found on the zJailbreak app store. So you must install zJailbreak app store first. Step 01 - Open zJailbreak. Step 02 - Install Silzee app. Step 03 - Install G0blin online tool. Step 04 - Go to Settings > General > Profile and trust the app. Step 05 - Run the jailbreak process. DoubleH3lix modified version of H3lix jailbreak tool. DoubleH3lix tool supports iOS 10 to iOS 10.3.3 64-bit devices exclude above iPhone 6s Plus. DoubleH3lix online guide available to install Cydia. Step 01 - Launch zJailbreak and Install Silzee Online app. Step 02 - Run Silzee app and Install. Step 03 - Install DoubleH3lix from Silzee. Step 04 - Now go to Settings > General > Profile and device management and trust the DoubleH3lix. Step 05 - Tap the jailbreak button and continue the process to install Cydia. H3lix tool supports to Jailbreak iOS 10.3.3 to iOS 10 versions running 32-bit devices only. This Tool developed by tihmstar. Download H3lix IPA & Cydia Impactor from following buttons. Download Cydia Impactor latest version. Make sure to download according to your computer operating System. Step 01 - Open Cydia Impactor. Step 02 - Connect your device to PC. Step 03 - Drag and drop H3lix IPA to Cydia Impactor. Step 04 - Enter Apple ID details to install IPA. Step 05 - Go to Settings > General > Profile and trust the app. Saigon Jailbreak released for iOS 10.2.1 running all 64-bit devices by Abraham Masri / cheesecakeufo. Step 01 - Open zJailbreak and Install Silzee app. Step 02 - Launch Silzee app. Step 03 - Install Saigon from Silzee app. Step 04 - Go to Settings > General > Profile and trust the Saigon app. Step 05 - After complete trust process Tap the Saigon app. Step 06 - Click jailbreak start button to start the process. 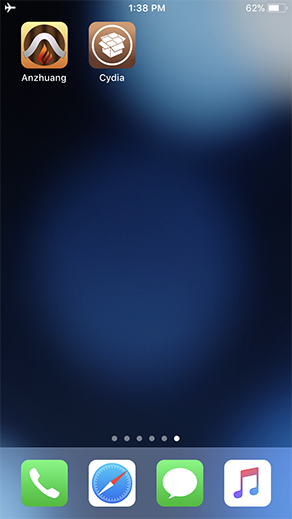 Step 07 - After final reboot, you can see Cydia icon on your homescreen. Yalu 102 Jailbreak released for iOS 10 to iOS 10.2 versions running 64-bit devices except iPhone 7 & 7 Plus by Luca Todesco. Step 01 - Download Yalu102.ipa from following button. Step 02 - Download Cydia Impactor according to the operating system. Step 03 - Do the following facts before start the jailbreak. Get the backup of your device data using iTunes or iCloud backup methods. You should turn off Find my iPhone, disable touch ID, disable the passcode, until complete the jailbreak process. Make sure you are running latest iTunes. Step 04 - Connect the device with the computer. Step 05 - Open Cydia Impactor. Drag & drop the downloaded Yalu102.ipa into it. Step 07 - Go to Settings > General > Device > Management > Trust to trust the Yalu102 app. Step 08 - Go to device home screen. It has Yalu102 app. Step 09 - Launch the Yalu102 app and click on the Go button. Device will restart when you tap the Go button. Step 10 - Now it will have Cydia icon on your device home screen. If it is not, run the Yalu102 and click on the Go button again. Yalu extra_recipe+yaluX tool released to jailbreak iPhone 7,7 Plus running iOS 10.1.1 version by Luca Todesco. Step 01 - Launch zJailbreak from your device. Step 03 - Open Silzee and install Yalu extra_recipe app. Step 04 - Now go to Settings > General > Profile and device management and trust the Yalu extra_recipe app. Step 05 - Then Run Yalu extra_recipe app to start the Jailbreak process. Step 06 - Finally It will be installed Cydia on your device. Phoenix tool is released to Jailbreak iOS 9.3.5 running 32-bit devices by Siguza and Tihmstar. Step 01 - Download Phoenix3.ipa from following link. Step 02 - Download Cydia Impactor according to the operating system using following link. Step 03 - Connect your device with the computer. Open Cydia Impactor. Step 04 - Drag and drop the downloaded Phoenix IPA file into the Cydia Impactor. Step 05 - Enter Apple ID and password to sign the IPA. then it will start to install Phoenix jailbreak app. Step 06 - When it done, verify to trust the Phoenix jailbreak app. General --- > Settings --- > Profiles & Device Management --- > Phoenix Jailbreak --- > Verify --- > Trust. Step 07 - Go to the Home Screen and open the Phoenix app. Step 08 - Click on the Prepare for Jailbreak button. It will start the jailbreak. Step 09 - Click on the Accept button. Avoid the unwanted apps by clicking Dismiss the “Free Mixtape Available” message. Step 10 - Click on the Proceed With jailbreak----> Begin Installation----> Use provided Offsets. Step 11 - It will begin the jailbreak process and let it to done. Ignore the storage almost full message while complete the jailbreak process. Step 12 - It will reboot your device, when it complete the jailbreak. Now Cydia icon is available on your device homescreen. Note - Repeat the jailbreak process when you are unable to download Cydia. Jailbreak.me supports to Jailbreak iOS 9.1- iOS 9.3.4 running all 32-bit devices. Jailbreak.me is Safari based online jailbreak solution. Follow the below guide to jailbreak your device. Compatible Devices : iPhone 4, iPhone 4S,iPad 2, iPad 3rd generation, iPad mini, iPod touch 5G. BetterHomeDepot Jailbreak is released for iOS 9.1 to iOS 9.3.4 versions running all 32-bit devices by jk9357 team. Compatible Devices : iPhone 4s, iPhone 5, iPhone 5c, iPad 2, iPad mini 1, iPad 3, iPad 4, iPod touch 5. Step 01 - Download Cydia impactor and BetterHomeDepot from following buttons. Step 02 - Plug your device to the PC. Step 03 - Run the Cydia Impactor tool and it will detect your device. Step 05 - Now you have to enter the Apple ID and the Password to install Home Depot app to your device. Step 06 - Now you have to verify the Home Depot app. Go to Settings --- > General --- > Profiles & Device management and trust the developer. Step 07 - Now Home Depot app has installed to your device.Run the Homedepot app. Step 08 - Tap on ‘Prepare for the jailbreak’ and Then click on the ‘Proceed with Jailbreak’ button. Step 10 - Finally Cydia icon will have on your homescreen. Pangu team has released English version for Jailbreak iOS 9.3.3 to iOS 9.2 versions running 64-bit devices. You can get Pangu online jailbreak from Silzee app. Step 01 - First, install the zJailbreak app store to your device. Step 02 - Then install SIlzee Online jB app from zJailbreak. Step 03 - Install Pangu app directly to your device. Step 04 - The Pangu9 app has installed to your device homescreen. Now the run the app. Step 05 - Ignore the storage almost full message. Then your device will restart again. Step 06 - Finally Cydia will be available on your homescreen.